I thought the assembly was fascinating! There were so many beautiful animals that I had never seen up close before. My favorite had to be the opossum. I liked it because when Bobby was holding it, it looked so sweet and cuddly. In the past I had always thought of the opossum as a mean and creepy animal. One fact I know about them is that they are omnivores. They will eat almost anything; and their diet varies by season. I agree with you, that assembly was so interesting! There were several animals that I had never seen before. The Harris hawk was new to me. I've seen pictures of them doing that stacking behavior, but I've never seen one up close. The gray fox was very sweet as well. It was so timid! It also had a very thick tail. Thanks for a great comment complete with a fun fact about the opossum being an omnivore. I enjoyed watching the video of the nature assembly. My favorite part of the video was the fox. Nick is a very good tutor on the computer. My name is Robyn and I am a student at University of South Alabama. I was given your blog as an assignment for my EDM 310 class. I found the assembly very interesting. I have never seen an owl like the barn owl, it was beautiful. The Macaw fascinated me, who would have thought that little bird could snap a broomstick in half. I enjoyed this post very much, the slide show gave it a nice little touch. What a great assembly! I think it is wonderful that you got to see animals up close that you might fear otherwise. I have to say that having a skunk up close is pretty cool. It's a good think they took out the scent gland. I also thought it was interesting to find out that possum's gave out an odor. Who knew? We have several in our back yard and I had no idea about the scent. Thank you for sharing such great pictures of all the animals. My favorite animal is the French Bulldog. It has big ears that stand up, just like a bat's. These dogs are short and sturdy, with smoothe coats and a stub tail. They weigh about 20-28 lbs. They are very active. I know this because I have a French Bulldog of my very own named Trixie. She is very friendly and loves to be hugged. French Bulldogs are decended from English Bulldogs. The French people wanted a similar dog, but one that was smaller. I love my "Frenchie"! My favorite animal in the assembly was the opossum. It was my favorite because I like how they play dead when there is a predator approaching and how it stinks when it plays dead. I learned some interesting facts about a hammerhead shark. I learned that the hammerhead shark has one eye and one nostril on each side of its head. Another fact about the hammerhead is that they live in warm and tropical waters. Scientists think that the flat head makes it easer for them to swim. Did you know any of those facts? P.S. I bet if you put glasses on a hammerhead, they would have to be very wide and long. Thanks for visiting our blog and for leaving such a nice comment. I was surprised that the macaw had such a strong beak. The owner said that she got the bird because the parrot had a bad habit of screaming, and no one wanted her. That would be tough on the ears! Thanks for such a thoughtful comment! Seeing wild animals up close was engaging for everyone. The ferrets smelled the worst. They were very cute, but the MPR smelled of them for hours! Dear Mrs Yollis and students, I just loved the fact you had all these wonderful wild life animals come for a visit to your school. I must say my favorite animal is the barn owl they have the most adorable face. The barn owl is sometimes called monkey face and did you know that its eyes are smaller than other owls.They also mainly hurt small prey and build nests in hollow trees and buildings. Also barn owls are found worldwide except in Antarctica and Micronesia. Hope you enjoy finding out more about this beautiful animal as I do greetings from AA. I'm Brittany South from South Alabama. I am in the EDM310 class. I was assigned to come and read you all's blog. I really enjoyed the video of the animals. I liked many of the animals, but some I never heard of before like the Harris Hawk and the Kestrel. I will have to say the gray fox was my favorite because it was so cute. I would say that the barn owl was my favorite because it is in the Harry Potter movies. I never knew that if you squeeze its head, it looks like it doesn't have any bones! Hi Mrs.Yollis I really like the picture of the bobcat. Hi Mrs.Yollis, I really like the bobcat picture. I also really like the hawk, the owl, kestrel, ferrets and fox. Also, owls have very good sight and hearing. Ferrets can worm through small spaces. Hi, Mrs. Yollis' class. I really like the Bobcat picture. My favourite animals are all big cats. Especially the Cheetah because it can run fast. A jet can fly super fast even when it doesn't even look like it. I always thought jets were slow because when your up in the air it looks like your going really slow but you're actually not. I relished the animal assembly! My favorite animal was the opussum because I think their way of living is enthralling. One of my favorite animals is the timid salamander that will not hurt you. It looks like a lizard, but it really is in the frog and toad family. There are more than 100 species of salamanders. For example there are mudpuppies, newts, and the tiger salamander. I really like the assembly. My favorite animal is the possum because it has a secret trick. It can play dead and it gives off a rotten smell. What was your favorite animal in the assembly? My favorite animal there was the large dog who could recycle because he was very well trained and that its really brilliant dog. I brought a ton of facts about the interesting puma. This small cat has 40 names! They live in North American mountains to prairies to rain forests of South America to deserts. This interesting cat has a red coat if it lives north and a blueish-grayish coat if it lives south. They both like to climb trees. The cougar will try to go toward its prey, then it will eliminate it by biting with its astonishing bite. The mountain lion as you know, is not a big cat, plus it doesn't even have anything in common with the fierce lion. In addition, it purrs and cannot roar. This cat can leap to 40 feet and 16 feet in height! My favorite animal was the gray fox. I liked it because it looked cute and cuddly. Another animal that was my favorite was the dog. The one I liked the most was the small dog because it looked beautiful and friendly. I loved the wildlife video. My favorite animal was the grey fox. She was so cute! I loved it because it was so pretty and fast. I also loved the opossom. Thank you for showing the video. 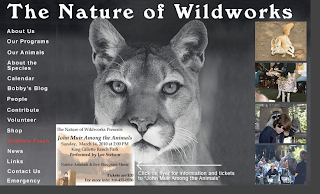 I wish I was there to see the amazing animals at the Nature of Wildworks Assembly. I have a story to share with you. When Ava was a little baby, I found out that there was a skunk living in our yard, naturally I was frightened that maybe one day when the girls were playing in the yard, they would be sprayed by the skunk, so I asked the Animal Control to come and take it away. They told me that this is his habitat and if we don't want him there, the only way is to leave the gates open so that he could possibly leave by himself. They told me that skunks are almost extinct and should be protected. I didn't want to leave the gates open, because we have other animals such as coyotes and even mountain lions have been spotted on the hills close-by. I started researching about skunks and found out an amazing fact that made me change my mind and welcome him in my yard. You see, Ava's sister Sadaf was bitten by a scorpion when she was 2 years old. I found out on the web, that skunks eat scorpions. That is the way mother nature works. We accepted that skunk, but I'm thinking to sign a contract with him to never invite his friends or relatives. I'm introducing the snowy owl. These owls sort of look like a snow owl (like a snowman) and have noticeable white wings. They can also echo its Arctic origins. This breed of owl natures on the Arctic tundra where the female lays eggs. The female lays 3 to 11 eggs. This amount of eggs is only laid by the female's diet. Parents of the owls will use their defense to protect their babies no matter what! Any comers, such as wolves will face the owl's sharp claws. Young owls, in particular, male owls get whiter as they get older. The female does the same thing, but they are darker, have dusky spots and never becomes completely white. This animal's weight in pounds is 3.5 to 6.5 pounds. The wingspan is 4.2 to 4.8 in feet and 20 to 28 in inches. The group name is called a Solitary. P.S. I got some info on World Book and National Geographic. The Nature Wildworks assembly was wikedly awesome! Today, I researched a budgerigar or also called a "budgie". They are in the parakeet family, and the best time for them to mate is now, spring. Can you belive that? They lay approximately fve eggs. My famly and I are planning to get one parrot from a parrot store which has many species of parrots. I can't wait! I thought it was really cool how all those animals were at our school. My favorite animal was the barn owl because you can squash its head and because of its dark white coloring. What was your favorite animal from The Nature of Wildworks? I'm introducing the snowy owl. These owls sort of look like a snow owl (like a snowman) and have noticeable white wings. This breed of owl lives on the Arctic tundra, and that is where the females lays eggs. The females lay 3 to 11 eggs. The more food a female eats, the more eggs they lay. Parents of the owls will use their defense to protect their babies no matter what! Any predators, such as wolves will face the owl's sharp claws. Young owls, in particular, male owls get whiter as they get older. The female does the same thing, but they are darker, have dusky spots, and never becomes completely white. This animal's weight is 3.5 to 6.5 pounds. The wingspan is about four. A group of snowy owls is called a parliament. Hi there! My name is Ingrid Welborn and I am a student at the University of South Alabama, located in Mobile, Alabama. I am commenting on your video post of Mollie Hogan's visit to your school for a course I am taking called Microcomputing Systems in Education (EDM 310). I enjoyed the variety of animal friends she brought for show and tell. I am familiar with the Macaw Bird because it is fairly popular. They are very big and loud birds and their favorite hobby is chewing! At this point in time, the only species of the Macaw that is not endangered in the wild is the Blue and Gold Macaw. This is true mostly due to deforestation. Another animal friend I am strangely familiar with is the opossum. This little creature is the only marsupial mammal in North America. I live in southern Alabama and we see these "dead playing" tricksters everywhere, including my mom's front porch! They hide under the porch chairs and eat my cat's food in the middle of the night! Thank goodness they take off quickly and don't hang out and play dead all night. I loved the cute, fact-filled video you composed of Mollie's visit to your school. It looks like it was a fun filled learning adventure! I really like this post because I love animals. My favorite animal was the gray fox because it was very cute! I learned that the barn owl wieghs less than a pound, and that is amazing.